Biola University associate professor of photography Kurt Simonson’s “Northwoods Journals” exhibit is on display in Newspace Center for Photography in Portland, Ore., for the holiday season. 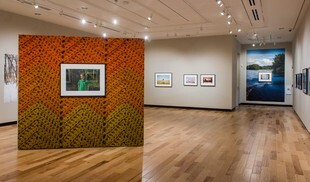 This marks the second time Simonson’s exhibition has been displayed as an exclusive body of work after it was shown at Biola in The Earl & Virginia Green Art Gallery in Fall 2013. Simonson, a Biola alumnus, had been shooting “Northwoods Journals” intermittently for more than twelve years in Minnesota, where he grew up. The collection began as a nostalgic series of images depicting his memories of home, however over time it evolved into the piecing together of his family narrative, detailing the complexities of family secrets, identity and shame. The solo exhibition will be on display from Dec. 5 through Feb. 2, 2015 and is the first national exposure for Simonson’s show as a solo body of work, although he has also had select photos from the collection displayed in photo centers, galleries and museums both nationally and internationally. Simonson secured the show after he submitted images from “Northwoods Journals” in a national jury show that appeared in Newspace Center for Photography last summer. He was accepted into the group show, and then the juror selected his work from all of the displayed photographers for a solo show. Another key image from “Northwoods Journals” called “Mikey's Truck” was shown in Foto8 Gallery in London in 2013 and has been the most viral photo of the series, said Simonson. As a photography professor, Simonson strives for a thought-provoking and engaging class atmosphere — an environment his students appreciate and enjoy. The show in Portland will increase Simonson’s national exposure and he hopes it will also attract the interest of more gallery and photo center curators across the country. One of Simonson’s current projects, “I Love You, Man” has also received a substantial amount of online buzz recently, appearing in Fraction Magazine. An image from that series was also shown at the San Diego Museum of Art, alongside some historical Renaissance art pieces, which was an unbelievable honor, said Simonson. See more of Kurt Simonson’s photography. Learn more about studying art and photography at Biola.